I got the inspiration for this game from a wonderful little book called Ga mes for Math by Peggy Kaye. I adapted it for spring because with the wonderful spring showers coming, what kid doesn’t love to jump in puddles? 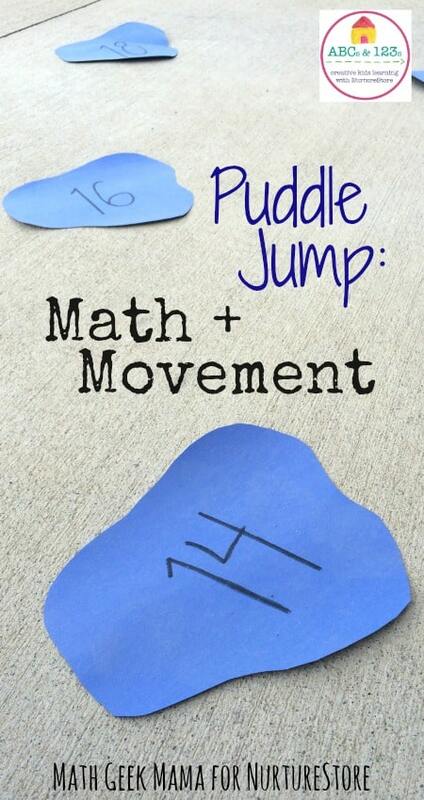 In my game, they get to learn math and “jump in puddles,” but without getting wet and muddy. The first thing you need to do is cut out “puddle” shapes from your blue paper. This does not have to be exact or anything fancy. I simply took a small stack of paper and cut a puddle shape out of several at once to save time. Once you have a pile of puddles (how many you need will depend on what numbers you are focusing on), write a number on each puddle. I suggest using a black Sharpie marker and writing nice and big so that it is easy for kids to see and read. I decided to focus on the numbers 11-20 with my kids (ages 6 and 7), but if you have younger ones you could use simply the numbers 0-5 or 1-10. Once your puddles are ready, it’s time to play! 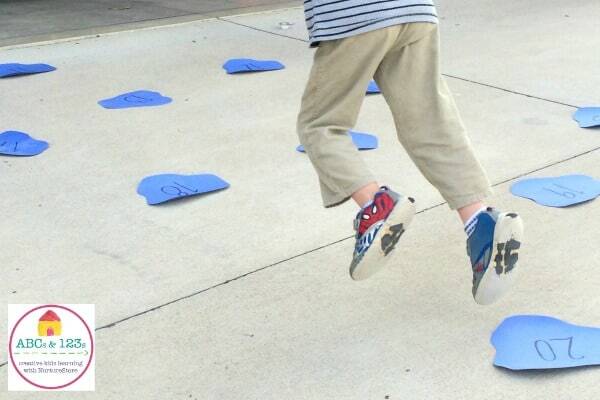 Lay all the number puddles on the floor or ground so that there is enough room for kids to jump from number to number (we played outside because the weather was nice, but you could play this inside as well, if you have the space). Also note that it may be helpful to tape the puddles down so that they do not slip or blow away (if you’re outside). To begin, I had my kids take turns jumping from number to number in order, starting from 11 and counting all the way to 20. 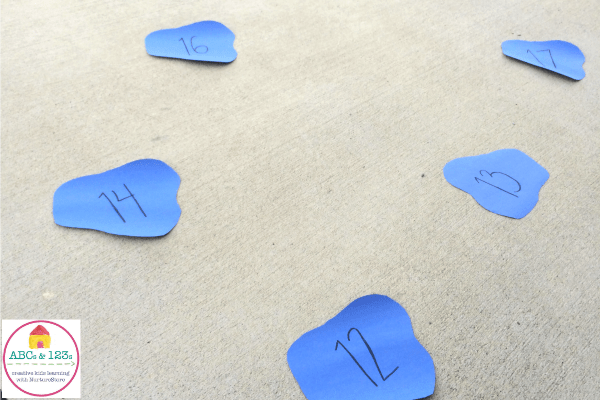 This was especially helpful for my son (6) who is working on recognizing the teen numbers. Then, they can jump back from 20 to 11, saying each number again as they count backwards. They had so much fun jumping around, I decided to challenge them a bit more. 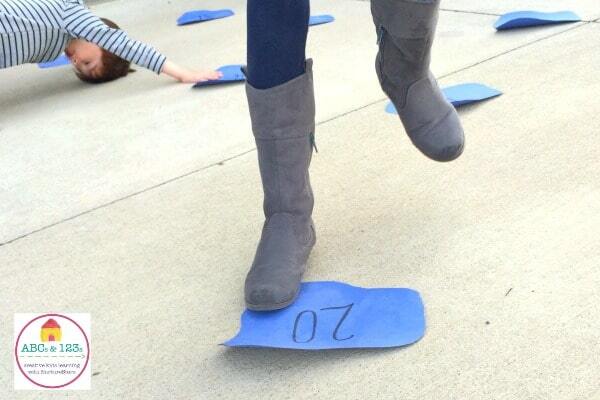 I told my son to pick a number to stand on. I then called out numbers (not in order) and had him jump to the correct number. Just be mindful as you call out numbers that you are calling a number close enough for them to jump to. I did the same with my daughter (7), but instead of calling out the number I would call out things like, “”1 more than 16″” and “”2 less than 15.”” This allowed her to work on her mental math skills as well as number recognition. 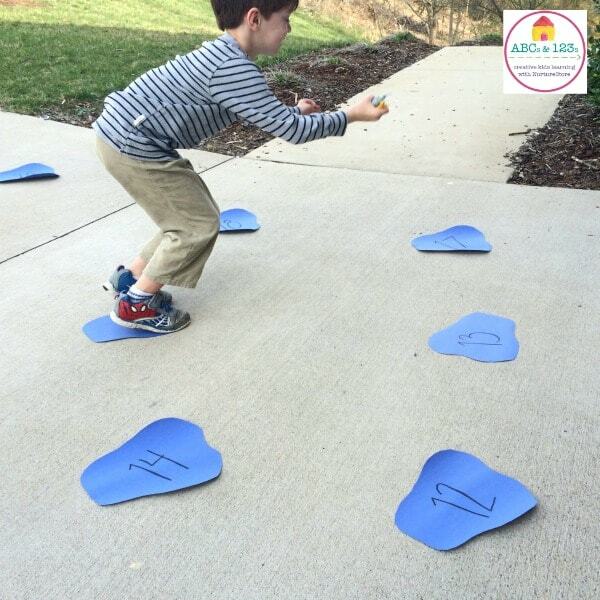 However you set up this game, kids are sure to benefit from the exercise and math practice! Bethany is the mom behind the blog MathGeekMama.com, a website dedicated to making math fun and engaging while building a strong conceptual understanding of mathematics. Be sure to subscribe to her free email newsletter to get her free ebook, Strategies for Problem Solving , as well as free teaching resources!